A Southern chain that specializes in splendid biscuit sandwiches comes to east Sarasota. "Boy George!" "Pearl Jam!" "Milli Vanilli!" It's lunchtime at Maple Street Biscuit Company, a fast-casual breakfast and lunch spot that opened in the Cooper Creek plaza late last month, and the space is ringing out with the names of bands and musicians. When you place your order, the staffer behind the counter asks for the name of your favorite musical act, not for your name, which leads to shout-outs that will have you chuckling while also questioning the taste of your fellow diners. The first Maple Street opened in Jacksonville in 2012. Since then, it has migrated to Georgia, the Carolinas, Tennessee and Texas, pulling in customers with a Southern-centric menu heavy on biscuit sandwiches and platters. A well-made biscuit is one of life's great pleasures, and here they're terrific: soft and flaky, with a bumpy, toasted exterior, and a sour-sweet flavor that is good on its own, but tastes even better when married to the shop's ultra-crispy fried chicken. 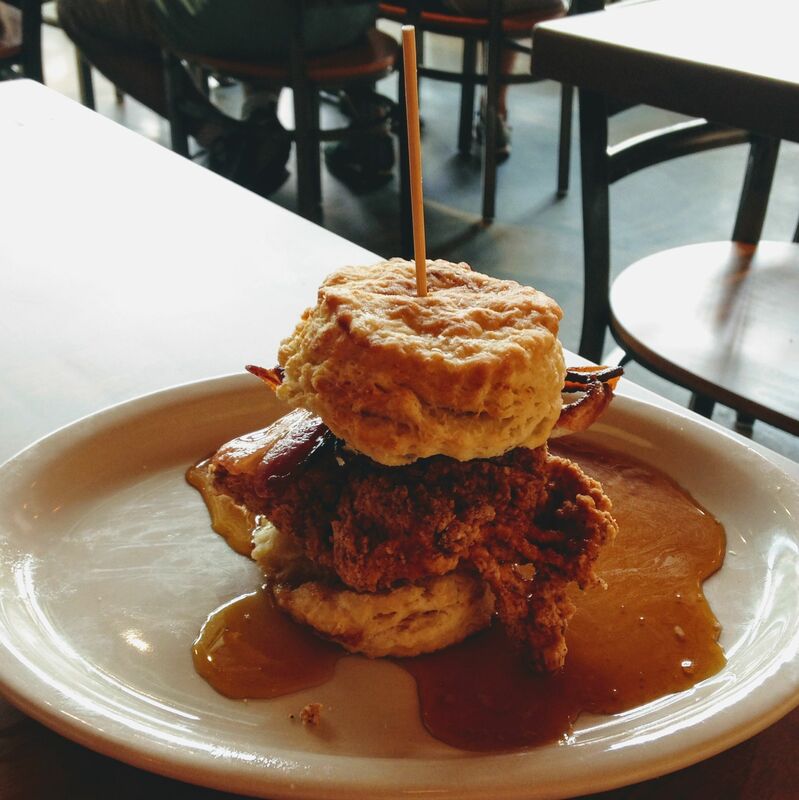 To sample what this place does best, order "The Sticky Maple," which packs a hunk of that fried chicken and a pile of crunchy bacon into a biscuit that rests in a puddle of maple syrup from Ohio's Bissell Maple Farm. The elements are simple, but together they ascend to the realm of the sublime. The sandwich is salty, peppery, crunchy, tender, sweet all at once—a $9 glimpse of paradise. Other biscuit sandwiches include one with a Buffalo bent ($9), another that smothers fried chicken with cheddar and apple butter ($9) and one that includes tomato sauce, feta and basil ($9). You can also order those same biscuits by the dozen ($12) or drowned in a peppery sausage gravy ($6). The sides are less successful. Fried green tomatoes ($5) are well-fried, but under-seasoned. The drip coffee ($2.50), meanwhile, is robust and, even better, bottomless. So check it out, but be sure to think hard about your favorite musician before you go. You might love biscuits and Limp Bizkit, but do you really want everyone else in the restaurant to know that? 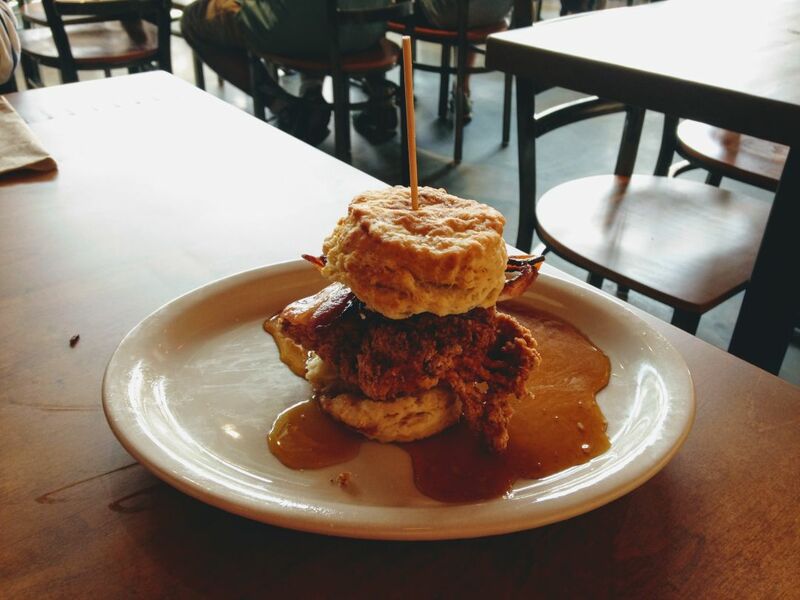 Maple Street Biscuit Company is located at 8491 Cooper Creek Blvd., No. 107, Sarasota, and is open 7 a.m.-2 p.m. Monday-Friday and 7 a.m.-3 p.m. Saturday. For more info, call (941) 358-5200 or visit the restaurant's website.